At Tyho-Galileo Research Laboratories, researchers theorized that Moore's Law could be used to predict future IVF outcome just as it had predicted advancement in technology. IVF procedure success has steadily increased in a linear path over the last seven years. Researchers suspected the linear progress started as early as 1985 though scientific evidence to prove such a theory was not included in this study. 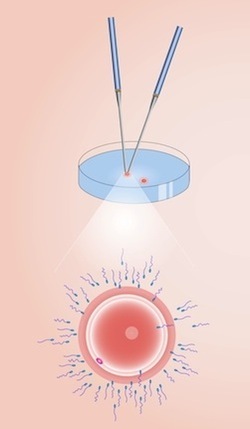 If IVF success is partially based on technology and the linear progress continues steadily into the future, Moore's Law predicts a 100% implantation rate by 2053 - possibly earlier for some clinics and later for some age groups. Conclusion: Despite a possible 100% implantation success rate as early as 2053, implantation rate is not equal to live birth rate. Live birth rates would be significantly lower than implantation rate even with advancements in technology taken into consideration. Source: Cohen J, Alikani M, Bisignano A. Past performance of assisted reproduction technologies as a model to predict future progress: a proposed addendum to Moore's law. Reprod Biomed Online. 2012 Sep 12. pii: S1472-6483(12)00529-9. doi: 10.1016/j.rbmo.2012.08.006.